For more than twenty years, Chabad’s mobile sukkah has traveled from fraternity row to North Campus assisting students in celebrating the holiday. This year, the sukkah began its rounds Sunday, October 8 and ended Wednesday, October 11. Built for the holiday Sukkot, the sukkah, a small, simple hut made of a wood frame, has white fencing and a bamboo roof. 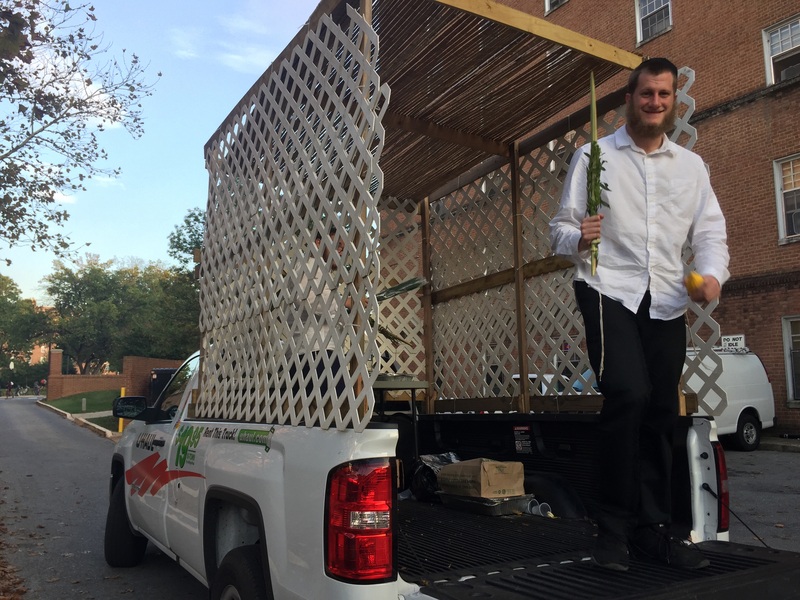 This sukkah rides around on a truck, stopping at commonplace stations such as Stamp Student Union and McKeldin Library to make it more convenient for students to go into the sukkah and eat a snack between classes. Rabbi Eli Backman, the rabbi at this university’s Chabad, builds and transports the sukkah to various locations on campus with the help of his children and family friends. Inside the sukkah is a table with muffins, homemade pastries and water. According to the mitzvot, or Jewish commandment, one is required to eat and live in the hut for the duration of the holiday. Backman, an Orthodox Jew, is always involved in the construction and enjoys bringing the holiday to Jews who might not be as focused on sukkot as they are on the daily concerns of being a student. Mendel Tenenbaum, family friend of the Backmans, smiles before walking down from the mobile sukkah. Anastasia Marks/Mitzpeh. Backman’s children, ranging in age from 2 to 21, are present on campus throughout sukkot and have several different duties throughout the holiday — including helping build the sukkah and mounting it onto the U-Haul pickup truck. Although the Backmans have their own sukkah at home, the family has repeatedly built an additional structure for students since 1995. Mendel Backman, 21, says that the process is not too difficult, but weather and circumstances change how long it takes from year to year. 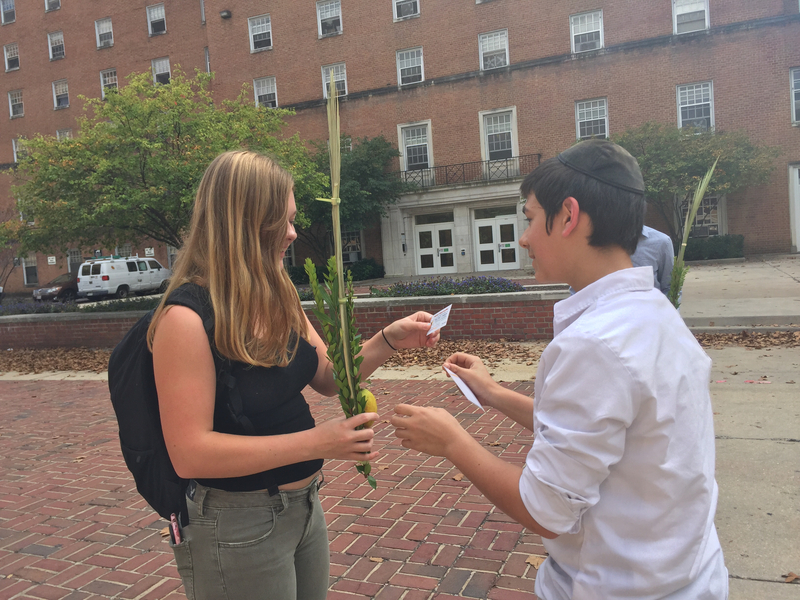 As students pass the sukkah, two of the Backman children typically stand nearby and invite students into the hut or to make Jewish blessings by shaking the lulav, a stalk made of four plants, and an etrog, a small yellow fruit similar to citron. Malky Backman, 8, is in her second year participating in the sukkot traditions, helping students more than twice and three times her age complete their blessings. Despite her youth, the second-youngest Backman is well-versed in the reasons for building the sukkah and the practices of sukkot. Beryl Backman, 15, teaches a student how to complete Sukkot prayers. Anastasia Marks/Mitzpeh. Jewish students on campus were both amused at and grateful for the novelty of the mobile sukkah, especially those who do not go home for the holiday. Jenna Marcus, a junior mechanical engineering major, had not shaken the lulav before seeing the pickup truck at the North Campus Diner. Marcus says was not able to celebrate the holiday with her family without risking academic consequences, so she appreciated that the she can follow tradition in a convenient way. By being mobile, the Backmans say they are able to reach more students with the holiday than if students were only to go to Hillel. With an average of about 40 people per location, the sukkah’s mobility makes the holiday more accessible, said Rabbi Backman. His son Yossel, 19, said spreading out to do blessings and bringing the sukkah around on the truck it is useful for expanding the holiday to as many Jewish people as possible. Yossel explained the effects he had seen had on students who visit the sukkah and receive blessings, including taking pictures and sharing the idea with friends. No Replies to "Chabad gives Sukkot a mobile twist"